Restoring a snapshot automatically detach the hard-disk from the SATA controller. ahci#0: The target VM is missing a device on port 0. Please make sure the source and target VMs have compatible storage configurations [ver=6 pass=final] (VERR_SSM_LOAD_CONFIG_MISMATCH). That is, when I click the restore button right after I can check by going into the storage configuration that my disk is detached. I can attached it again but then I'm back to the actual state and not the wanted snapshot state. 1attempt-dev.vbox (62.4 KB) - added by awilkin 6 years ago. 1attempt-errors.txt (195 bytes) - added by awilkin 6 years ago. 1attempt-snapshots.txt (903 bytes) - added by awilkin 6 years ago. 1attempt-VBox.log (70.9 KB) - added by awilkin 6 years ago. 2attempt-dev.vbox (74.4 KB) - added by awilkin 6 years ago. 2attempt-snapshots.txt (978 bytes) - added by awilkin 6 years ago. 2attempt-VBox.log (72.0 KB) - added by awilkin 6 years ago. I'm getting the above error when I try to restore some snapshots, ever since I upgraded to the latest 4.2.18 r88780 (Windows 8 64bit). It makes some snapshots inaccessible but some others are still working. As suggested on previous reports of this error, I tried disabling EHCI and upgrading to the latest Guest Additions, but neither of these steps prevents the error. Failed to open a session for the virtual machine Windows XP Pro Clone. piix3ide#0: The target VM is missing a primary master device. Please make sure the source and target VMs have compatible storage configurations [ver=20 pass=final] (VERR_SSM_LOAD_CONFIG_MISMATCH). FYI: Uninstalling 4.2.18 and then installing 4.2.16 has fixed this issue for me. I had a similar issue, unfortunately, all my VMs lost all there attachments in the process. I'm pretty sure there must have been some issue writing the xml file to the host, so I checked the .xml backup : it has 0 KB and is useless. I'm using 4.2.18 r88781, I tried downgrading to 4.2.16 without effect. I got the same issue once more, but this time I noticed that the attachment gets removed when the snapshot I try to create fails with the "Failed to create snapshot for virtual machine X". I though I could simply create a new snapshot but it seems like the current machine state is affected as well. Maybe this is caused by a write error on the media or something, but the drive I'm using appears healthy and windows (7) does not report any problem with the NTFS volume. I looked at the logs but couldn't really find something relevant. I was thinking about doing a manual backup of the .xml file before any attempt to create a new snapshot. One thing worth mentioning: my disk is a windows JBOD volume spawn across 4 disks. I also have indexing enabled on the volume. "Taking a snapshot automatically detach the hard-disk from the controller when the snapshot fails"
The VM is in a paused status, I'm not attempting a 'live snapshot'. I'm having the same issue. This ticket has been open for months but it seems 4.2.18 was released without doing anything about this. Installed an Debian 7.1, took a snapshot. Installed some packages, took some more snapshots along the way. Failed to start the virtual machine vm. Now my vm is in an unrecoverable state and I can't find a solution other than creating a new one from scratch. Failed to open a session for the virtual machine vm. I can confirm that this issue also affects 4.2.18 on OS X 10.8.5. Exact same error messages taking and loading from snapshots. I thought it was transient, as the 2nd snapshot attempt succeeded, but loading that snapshot failed completely. Reverting to 4.2.16 fixed the issue for me so far. We cannot reproduce the problem. We have tried this with a number of different setups. I think there must be some condition involved. Can you provide more information? The ideal case would be a simple test case, for example create a new dummy VM, change some settings, start the VM, take a snapshot, terminate the VM, restore the snapshot. I’m having the same problem (Linux guest on Windows host. Guest additions installed). I encountered an error when attempting a live snapshot (I can’t remember what the error was). I then paused the VM and tried taking the snapshot again, and it worked. I don’t know if the error contributed to the snapshot losing its disk or not. Looking at <HardDisks> in the vbox XML file, I see an orphaned disk that has no associated snapshot and is not part of the current state. I also have a snapshot that is missing its <AttachedDevice> entry. All subsequent snapshots are also missing their entries. I was able to recover the snapshot by adding an <AttachedDevice> entry and referencing the orphaned disk. However, all subsequent snapshots were unrecoverable because no vmdk files exist for them (though they do have SAV files). It seems no vmdks were written after the first snapshot lost its disk. I have the same error ! Please contact me via email so I can provide you more details about the context when this error happens. Problem occurred again. I attempted to save a snapshot. I got a message saying "The Virtual Machine is currently in the Paused state and not able to see any keyboard or mouse input...". After clicking OK, I got this error: "Failed to create a snapshot of the virtual machine dev". I checked the vbox file, and indeed the most recent <HardDisk> element had been orphaned. Make sure all VBox processes are shutdown or my recovery trick above doesn't work. I am experiencing this issue as well. First the the snapshot fails "Failed to create a snapshot of the virtual machine MY-VM-NAME" then on trying again to snapshot, no error is presented, but looking at the details of the snapshot indicates that it is now detached. Trying to play this snapshot after it has been restored fails. I have only tested this when taking snapshots while the machine is running. I find it generally occurs when I create a snapshot (which works fine) not long after creating a previous snapshot (perhaps within the last 30 minutes). All using VirtualBox 4.2.18 (I never had this issue on VirtualBox 4.2.16 or older). I am encountering this issue as well. I have the latest VirtualBox 4.2.18, host is Windows 7, guest Windows 8 (both 64-bit). I tried to create a snapshot. The first try failed, gave some error. Tried to create the snapshot again and the second time was successful. Then saved the machine state and closed VirtualBox. Next time I try to restore it, it gets to 95% and then finds it is missing a device. When I open the configuration I see that no storage is listed for the machine, but I do see the path to my .vdi in the XML. 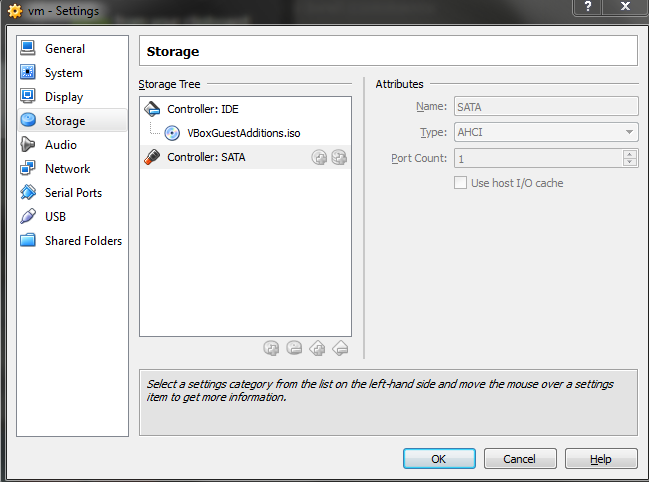 I cannot add the storage via settings as I am locked out, VirtualBox is not allowing me to edit. So far for this image I've done one full clone. After that I took a couple of snapshots (on that clone). One of the snapshots gave the error "Failed to create snapshot for virtual machine X". Snapshot creation worked, when retried. At this point I had the virtual machine constantly running for 2 days. After creating a couple of more snapshots I shut down the virtual machine. Attempt to restart that vm failed in an error "FATAL: Could not read from the boot medium! System halted.". Attempt to restore an earlier snapshot resulted in the same error as described in the ticket description ("The target VM is missing a device on port 0"). As Frank pointed out above we are not able to reproduce this problem so far. Maybe someone who can reproduce this can attach the VBox.log and VM settings file before restoring the snapshot and after restoring it when the error happens. Ideally getting the VM settings after every step would be great so we can see what exactly changed after each step. So far it looks like a regression in 4.2.18 and there are only reports from Windows hosts and one OS X host as far as I can tell. Unfortunately the chance to get this fixed is rather low until we can reproduce the problem ourself. Added log files. The bug is intermittent so these steps don't always work. 1) Attempt a live snapshot. 6) Next time the VM is started, "missing a device on port 0" error reported. This is just what happens for me. Other people's steps may be different. The only difference is that I didn't pause the VM before the 2nd snapshot attempt. Thanks for this information! I'm able to reproduce the issue now. Pausing the VM before the first snapshot makes the difference here. The problem should be fixed in the next maintenance release. Did the fix for this Ticket make it into the 4.3 release today? What is the workaround at this time to reatatch a drive lost during taking a snapshot procedure? Hello, I am having this problem as well. I was running 4.2.18 at the time that it began. I have no idea what caused it. From what I am reading, maybe I upgraded to 4.2.18, maybe that was what caused it. I cannot determine what I did or what I should do, I have been reading everything I can find about this. I upgraded to 4.2.3, same problem. I uninstalled 4.2.3 and reinstalled 4.2.3, same thing. I installed 4.2.3 and went back to 4.2.16, same issue. I have tried a lot of things, I have gone back to previous snapshots, I have discarded my state. I even had a backup of my virtual machine and I tried going back to that...oddly enough, it also fails to load with the same error! No matter what I do, I cannot get past this problem. Incredibly frustrating. once attached, i was able to start the VM (in the state of the snapshot) again. but i was glad, that it was running again! I have got the same problem with three of my VM, and found the solution. VirtualBox says that storage is detached, so we have to make the link to the storage. Don't modify .vbox or others files ! Next, your can't restore an older snapshot ! Create a new snapshot. Did the fix for this Ticket make it into the 4.3.2 release today? Yes. The fix will also be part of the next 4.2.x maintenance release. VirtualBox 4.2.18 r88780 on Windows 7 64-bit. FWIW I'm running F-secure with deep guard enabled. Other than that, it's just a standard Win7 client as host. Guest in Debian 7.2.0 amd64. Symptoms exactly as reported in this thread. Benjamin - thanks very much for your directions above. I followed and am now able to boot the VM. But I've lost an as-yet-to-be-determined amount of work from yesterday which is a major bummer. Any word on the availability of a patch for this issue? This is a really nasty bug. Hi, unfortunately this is still happening for me too and it's very annoying. I often lose work. Let me know if I can be of any help. Fix is part of VBox 4.2.20 and 4.3.4. Hi, I am using Ubuntu 12.04 and Virtualbox version is 4.2.10 r84104. My current state is showing last snapshot data. Last snapshot I had taken on 6th SEP. 2013, all data which I had saved after last snapshot has been lost. Is there a way to restore to last/previous session state? Please let me know soon. I'm on 4.3.6. On 4.2.18 I had this same problem so I upgraded. I am still not able to recover my snapshots. Drive was detached I reattached it and it booted the original image. Looks like this version does not fix the problem. I hope this helps someone else, if you've re attached the storage and it's an old snap shot, instead attach the latest snapshot.vdi instead. Point your others storage disk to their original place.